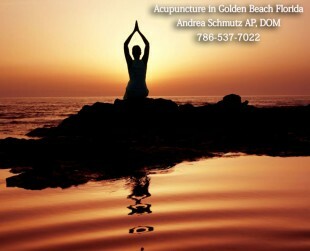 Acupuncture in Golden Beach – South Florida acupuncturist Andrea Schmutz is just a stone’s throw away from the Golden Beach area. Here new wellness center is located at 17971 Biscayne Blvd in Aventura, directly behind the Olive Garden in the medical building. Andrea has been in practice since 2008 after receiving her degree from ATOM – The Atlantic Institute of Oriental Medicine – with an emphasis on the 8 Principle method of Traditional Chinese Medicine. Andrea specializes in pain management, women’s wellness (including infertility), and pediatric medicine. She also utilizes acupuncture and Chinese medicine to address a myriad of other conditions or diseases. Andrea brings a unique skillset to the table. Prior to her training in eastern medicine, she has over 10 years experience as a registered nurse working in pediatrics (Joe DiMaggio Children’s Hospital) and infertility (at Fertility and Genetics in Plantation). Knowledge of western medicine, treatment with eastern medicine. It doesn’t get any better than that! Having the confidence in your practitioner that they fully understand your condition or disease is very easing on the mind. Knowing they can treat your condition or disease, effectively, with the power of holistic medicine is completely satisfying. If you live or work in the Golden Beach area and you’re frustrated with conventional western medicine, we implore you to give acupuncture and holistic medicine a try. It is safe, it is effective, it is a powerful treatment modality that can greatly enhance and improve the quality of you’re life. If you’re suffering let us help! Call 786-537-7022 to get started today. We accept insurance.